Dr. Varga received a B.S. in Mathematics from the Case Institute of Technology in 1950, an A.M. in Mathematics from Harvard University in 1951, and a Ph.D. in Mathematics from Harvard in 1954. From 1954 until 1960, he worked for Westinghouse Electric Corporation, Bettis Atomic Power Laboratory (Pittsburgh). Since 1960, he has held over 25 academic posts. Dr. Varga has published over 200 papers, written 7 books (which have been translated into 6 foreign languages), edited 5 additional books, organized 20 international conferences, and advised 25 Ph.D. graduate students. His most recent book is "Ger�chgorin and His Circles", published by Springer-Verlag. He is currently an Emeritus University Professor in the Department of Mathematical Sciences at Kent State University in Kent, Ohio. 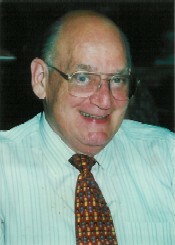 He had been a Research Director, along with Professor Paul S. Wang, of the Institute for Computational Mathematics at Kent State, and he remains a Founding Editor of the online electronic journal, ELECTRONIC TRANSACTIONS ON NUMERICAL ANALYSIS. Other editing positions, held outside of Kent State University, are also listed in the Editing Activities in the section of his Vita.